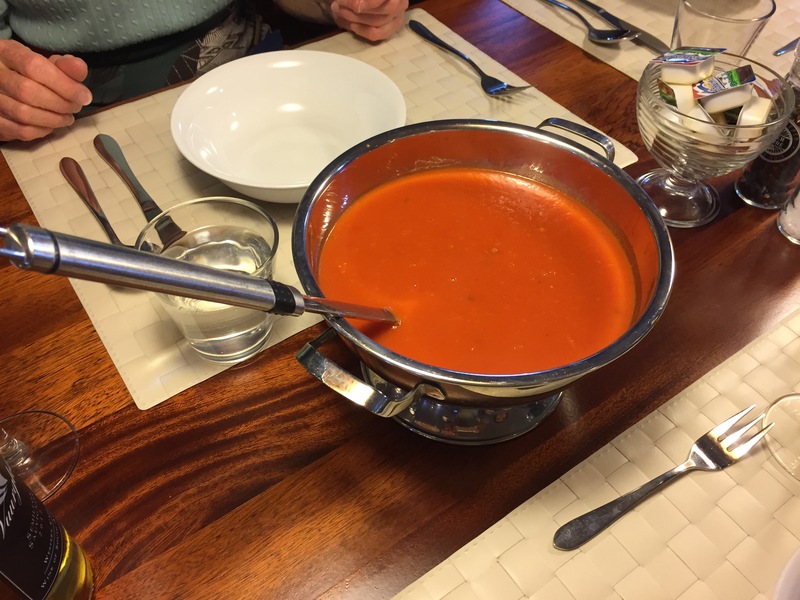 Biking in The Netherlands – 08 – Leiden to Gouda | John's Space …..
Gouda is a real treat. More on that later. Everyone has heard of Gouda cheese haven’t they? Remember I spoke about those Dutch pronunciations? Of course many of us ‘Mericans pronounce Gouda as ‘GOO-da’. To the Dutch it is ‘HOW-da’, as in ‘HOW-da heck are ya?’. Fancy that. I’ll stick with ‘GOO-da’ in the U.S. and ‘HOW-da’ in the Netherlands. On the road to ‘HOW-da’ (Gouda) we are waiting on a drawbridge in Hazerswoude-Rijndijk. It seems like there are fifty shades of drawbridge in the Netherlands. If memory serves me (?!?) we stop at a senior’s home/cafe for coffee and a pastry. (Shades of future present!) Sorry, no picture. On we bike to Boskoop. This map by the church is the kind you can get to navigate the walking and biking paths. Our bikes racked by the church. 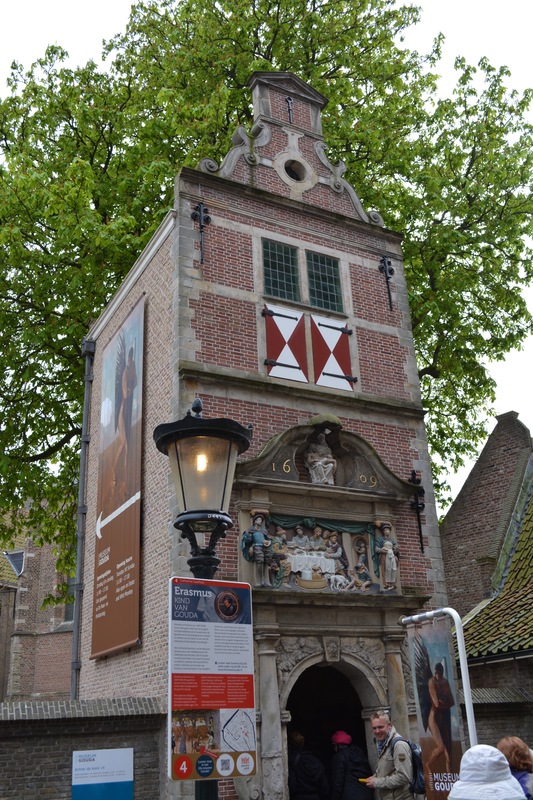 In Gouda (keep thinking ‘HOW-da’) we stop between the Sint-Janskerk (St. John’s Church) and the Gouda Museum. We stroll through the church on our own for a short while as later we have an in-depth guided tour. Then our guide takes us to a cheese shop and the Town Hall. Our tour of the church includes the beautiful stained glass portrayals of Bible stories and patron symbolism. As our guide notes the windows were the picture books for the illiterate masses of the time. At 123 meters this is the longest church in the Netherlands. A bridge not too far, and not high enough this time. Dutch engineering is on the job. Thankfully our barge was not trapped on the other side else we’d be staying in Gouda many nights! Biking distance today is 27.2-29.9 miles, longer due to the back-haul from Gouda. HRM says about 9 1/4 hrs and 3600 kCal. I need that calorie burn because… you can’t call me late for dinner. It’s barge night tonight at our rendezvous. Tomorrow yet another great day of biking awaits. Gallery | This entry was posted in Bicycling, EUROPE, Netherlands, Photography, Recreation, Travel, Travel photography and tagged Bike and Barge, Boskoop, Gouda, Gouda cheese, International Bicycle Tours, Leiden, Netherlands, Photography 101 Forever, Saint John's Church, Sint-JansKerk, stained glass windows, Waddinxveen. Bookmark the permalink.